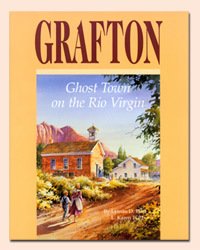 The Grafton Heritage Partnership reprinted Lyman and Karen Platt’s book Grafton, Ghost Town on the Rio Virgin. It is a 200 page book first published in 1998 and provides insights into the daily lives of settlers. You can purchase the book using PayPal, or you can mail us a check.